Join us in Houma, Louisiana for the 2011 Torch Classic! The 27th Annual Torch Classic will take on a creole flare as we journey to the great state of Louisiana June 22 thru June 26. 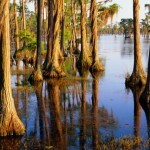 Experience the rich flavors of gumbo, etouffee, and jambalaya, spend a day fishing, or book a birding or swamp tour along the ecologically rich wetlands stretching out toward the Gulf of Mexico.